“Foust Forward” appears in every issue of SpaceNews magazine. This column ran in the Oct. 22, 2018 issue. There’s a widely held belief in the space community that Congress has banned bilateral cooperation in spaceflight between NASA and its Chinese counterparts. In fact, the language in the so-called “Wolf Amendment” in NASA appropriations bills, named after former Rep. Frank Wolf, requires NASA to get congressional approval in advance for any cooperative activities. That’s allowed some limited cooperation between NASA and China in areas like aeronautics and Earth science. Early this month, the two countries appeared to open the door for additional cooperation. 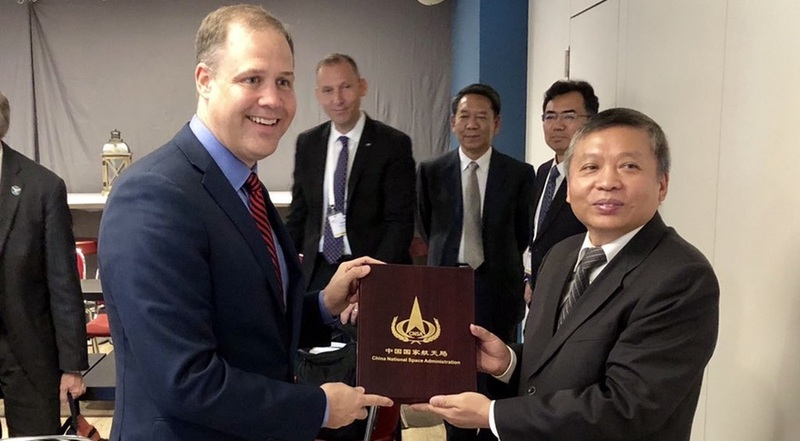 Appearing onstage at the International Astronautical Congress (IAC) in Bremen, Germany, NASA Administrator Jim Bridenstine and Zhang Kejian, administrator of the China National Space Administration, seemed willing to work together in space exploration. Bridenstine, at a later news conference, praised China’s growing space capabilities, such as its upcoming Chang’e-4 mission, which will be the first to attempt a landing on the moon’s far side. “We can share data and collaborate that way so that each country can learn more about science,” he said. Two weeks later, during a panel discussion in Washington on the past and future of lunar exploration, National Space Council Executive Secretary Scott Pace suggested that the U.S. and China could later exchange lunar samples once China carries out its Chang’e-5 lunar sample return mission in 2019. Before we celebrate a new era in U.S.-China space cooperation, though, there are obstacles to overcome on both sides of the Pacific. Pace lamented a lack of trust between the U.S. and China. He cited as an example the difficulties coordinating with China a planned impact of an unnamed Chinese spacecraft on the moon: American scientists were interested in observing that impact with NASA’s Lunar Reconnaissance Orbiter, and exchanged information on orbits with the intent on coordinating observations of the impact. Of course, many in the U.S. are worried about Chinese space ambitions as well. Apollo 17 astronaut Harrison Schmitt, appearing on the same panel as Pace, warned of Chinese plans “to occupy the moon.” If NASA doesn’t accelerate its plans, he said, “you’re going to have Chinese boots on the moon.” Statements at events like the IAC can open the door to enhanced cooperation between the United States and China in space, but the two countries still must be willing to walk through that door.